Many of us were taught in elementary school the rhyme, “Sticks and stones may break my bones, but words will never hurt me.” It was taught to us to teach us to ignore people who say mean things to us; that their words cannot physically hurt us. Sadly, this rhyme has been cast aside and great effort had been made to stop anyone from saying anything that might offend someone. However, in the process, lying or not telling the truth based on the situation has been promoted as sometimes being right. For this reason a Bible lesson and life application study of the ninth commandment, “You shall not bear false witness,” is necessary. What does the bearing false witness mean? The phrase bearing false witness is commonly described as lying. However, it is more specifically referred to giving false testimony as a witness (1). In other words, it is the act of telling a falsehood about something or someone to others in a legal context. 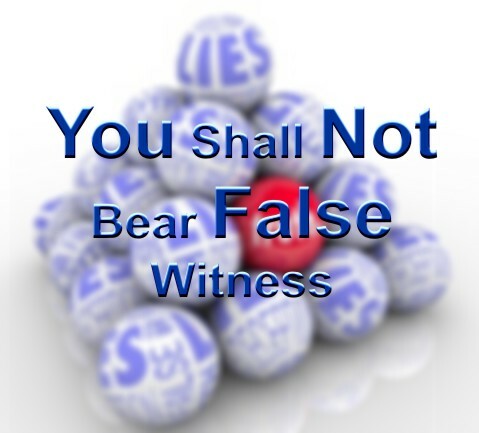 What does God say about bearing false witness? The ninth commandment reads like this: “Thou shalt not bear false witness against thy neighbor” (Exodus 20:16). Like the common definition, the phrase “false witness” in both the Old and New Testaments refers to someone who lies or tells falsehoods. In the New Testament, the Greek word pseudomartys (2) that is used is a compound word containing pseudes and martus. Pseudes is commonly translated as liar or false, meaning untrue, erroneous, deceitful, or wicked (3). Martus is commonly translated as witness, record, or martyr (4), which Christians commonly use when referring to someone who is killed for their testimony of faith. In Ephesians 4:25 we are told, “Wherefore putting away lying, speak every man truth with his neighbour: for we are members one of another.” It is pretty clear from this verse and others that we should not lie. However, some people will point to the Old Testament story of Rahab, who lied about Israelite spies to protect them, being blessed by God (Joshua 2 and Joshua 6). When you read the story closely in Joshua 2 and Joshua 6, you find that Rahab was not blessed because she lied, she was blessed because she trusted that their God was the one true God (Joshua 2:8-11; Hebrews 11:31). It was because of her faith that she was saved and faith also motivated her to hide the spies. Hiding the spies simply demonstrated that she was justified before God because of her faith (James 2:25). Despite Rahab’s good intentions, making up the cover story was a sin. This demonstrates to us that often our hearts may be in the right place, but how we go about doing something may be sinful. An example would be in Romans 12:14-21 where we are told that vengeance belongs to the Lord. We may think that we are doing the Lord’s work by paying back someone with evil deeds who is doing evil against us, but that is not God’s desire for us, which would make our actions sinful. What is the Spiritual perspective of lying? Lying is tied to murder. Lying has at its root deception, which was first used by Satan to deceive Eve into rejecting God’s Word and instead worshipping Satan. This sin is the foundation of keeping people from trusting Christ and being saved, which results in their murder or death (Romans 6:23; Romans 7:11; Titus 3:3). This is the same tactic used by false teachers (Matthew 24:4-5; Romans 16:17-18; Ephesians 4:14; 2 Peter 2). Lying is not a fruit of the Spirit. People who lie are presenting a testimony that the Holy Spirit does not abide in them (Galatians 5:22-23). Lying demonstrates the works for the flesh (Romans 8:29; 1 John 1:6; 1 John 2:27), which is contrary to the Spirit (Galatians 5:17). Lying is not rooted in truth. Lying is contrary to the truth, which is God’s Word (Proverbs 30:5-6; Psalms 33:4; John 1:14; John 17:17). It is by the truth that we are saved and able to speak the truth in love (Ephesians 4:25-29) as we share the truth with others. God commanded us not to lie in the ninth commandment. Although this was an Old Testament commandment, it pointed to the fact that lying is not in keeping with loving our neighbor. More so, when it comes to lying, it results in murder by stealing the truth from others, denies the indwelling of the Spirit in the person lying, and is not rooted in truth of God’s Word. Lying is modeling the behavior of Satan who steals away men through deception, which steals the word from their hearts. Those who lie on behalf of Satan are false teachers. Related reading: What Does the Bible Say About Lying? Well said, lying is not condoned anywhere in the OT or NT. In fact as you have said, it is commanded that we not lie. Some of the Patriarchs, such as Abraham told a half truth(lie…which it really was) because he had his wife Sara, say she was his sister so the local king would not kill him to take Sara for his own because Sara was beautiful(wow, she must have used some type of wrinkle cream at 90 years of age…;-)). But OTOH, we are born liars. From birth we follow the god of this world. We don’t have to teach our children to lie do we? Mohammed moved it up a notch to a religious sport though, with rewards for the participants(his followers). Many reading are familiar with al-Taqiyya: lying, which is condoned by the Quran. “Situations or purposes for which Islamic scholars collectively judge it to be permissible to lie include the following: to reconcile arguments, to settle family disputes, to settle arguments specifically with wives or women, to safeguard one’s “innocent” life (i.e., not for criminals on trial), to protect the lives of other Muslims, to defend one’s honor, to succeed in jihad or combat, and to spread the practice of Islam. Having said all of that, and being a Christian and determined that I will not lie…when my wife asks me if her rear looks big, I am in a tough spot…;-) Any advice? I am sorry brother, but you are on your own on this one as I would not dare to suggest a direct yes or no answer. However, no matter what your answer, and considering the size preference of all involved, I would default to what my wife said in that it is perfect. However, if that would be a lie then a Galatians 6:1 approach is in order.